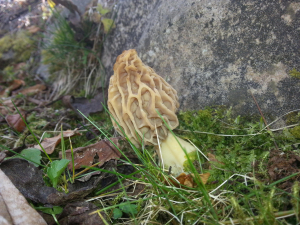 Observation - Morel - UK and Ireland. Description: Approx 7cm tall. White stem. Buff coloured honeycomb 'cap'. The lawn has regularly had woodchips on it over the last few years. Approx 7cm tall. White stem. Buff coloured honeycomb 'cap'. The lawn has regularly had woodchips on it over the last few years.